Tablet panel prices increased a bit in March, but other display applications continued to decline although some TVs sizes were up a little. On a general basis, demand remains weak, with only two points of potential stimulus to panel prices. First, shortages (mostly components such as CPUs and COF) have caused monitor and notebook producers to back away from production, causing lower panel demand and forcing panel makers to reallocate production to other display products. Second, the ‘lemming effect’, where panel buyers, especially TV panel buyers overreact to small panel price increases and jump back into the market to avoid being caught up in an increasing price spiral. As this reaction tends to be the stimulus for such price spirals, much depends on TV set panel inventory, which dictates how aggressive panel buyers feel they must be, and presently, inventories remain higher than normal. Panel producers will certainly try to take advantage of such a scenario and will raise prices whenever possible, but until TV panel inventories are driven lower, such a scenario will likely be muted. Third, panel buyers understand that some panel price increases are necessary, especially when panel producers are working at or below cost, and buyers will accept relatively small increases in 2Q and a bit more in 3Q when demand is highest, but if panel makers push prices aggressively, buyers will fall back on lower priced inventory and walk away from such deals. Fourth, aggressive pricing by Chinese panel producers as they add capacity will make it difficult for panel makers to any sustained panel price increases for the remainder of the year, normal seasonality aside. 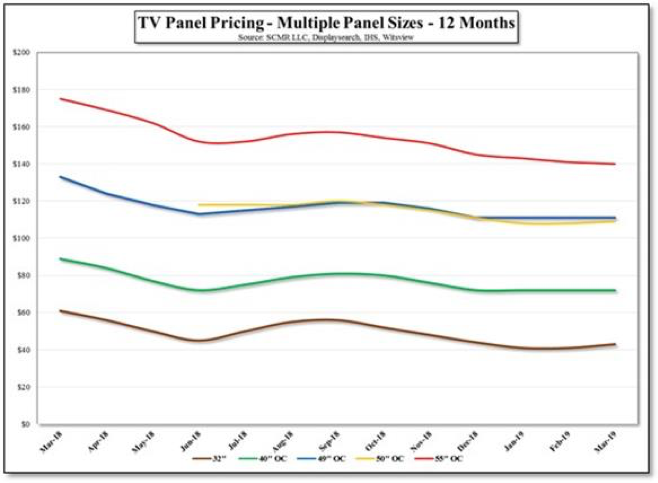 There is also a disparity between TV panel prices as certain panel sizes are far more volatile than others and are affected by some targeted factors. Larger panel sizes, particularly those 65” and above are directly affected by Gen 10+ capacity that has and will continue to come on-line this year and next, while 40” and smaller panel pricing is not affected by such capacity where panel makers are willing to supply low margin panels.